With the exception of bankers and their lobbyists, the financial crisis has also been hard on everyone. No single group feels more besieged from the outside and beset by fretful soul-searching from within than economists. They are scrambling about to come up with not only explanations of what happened but also to build better models that will predict and therefore, prevent, future crisis. There is an overflowing bookshelf by now composed of books trying to explain to a shell shocked public what just happened. A great one that I reviewed a few months ago, and highly recommend, is Bailout Nation by Ritholtz. Another that I’m reading now and will review shortly is The Cost of Capitalism by Barbera. 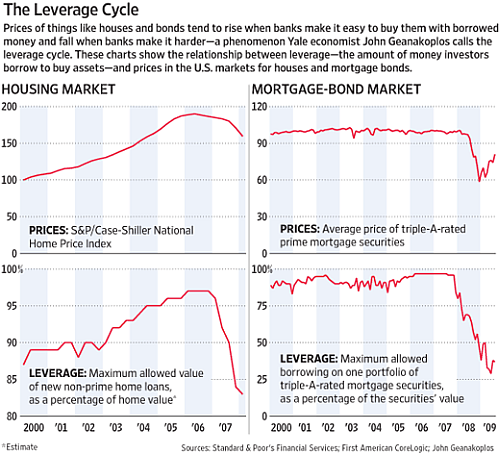 Using large amounts of borrowed money, or leverage, these buyers push up prices to extreme levels. Because those prices are far above what would make sense for investors using less borrowed money, they violate the idea of efficient markets. But if a jolt of bad news makes lenders uncertain about the immediate future, they raise margins, forcing the leveraged optimists to sell. That triggers a downward spiral as falling prices and rising margins reinforce one another. Banks can stifle the economy as they become wary of lending under any circumstances. While this is persuasive, it isn’t all that new or innovative. During the first bubble of the millennium, many called for the Fed to increase margin requirements on trading accounts to curb rampant speculation in technology shares. Being against intervention, Greenspan muttered something about free markets and offshore asset flows and didn’t do his job. We’ll never know if the first bubble and subsequent crisis would have been averted had the Fed removed the punchbowl before everyone got tipsy. Right now, the leverage cycle is fighting against the interest rate cycle. The Fed has instituted a new carry trade which has decimated the US dollar and awakened the great gold bull. As the two giant cycles battle it out, the economy and the stock market hang in the balance. In the model economy shown here, that willingness directly relates to the perceived possibilities for profitable investment—and since these are limited, so also is the uptake of debt. But in the real world—and in my models of Minsky’s Financial Instability Hypothesis—there is an additional reason why the public will take on debt: the perception of possibilities for private gain from leveraged speculation on asset prices.